The 18th Annual Florida Music Festival & Conference is excited to welcome the seminal name in Electronic Dance Music festival and events, James Estopinal, better known to millions of Fest goers as Disco Donnie! Boasting a history of groundbreaking Keynote Conversations with promoters, producers & industry veterans including the founders of Bonnarroo, Warped Tour, Glastonbury among others, FMF2018 serves as a warm up to Disco Donnie’s southeastern summer kickoff with the Sunset Music Festival in Tampa, Florida in late May. FMFers, students and musicians can look forward to a candid conversation with one of the original voices in the EDM genre and experiential festival concept. 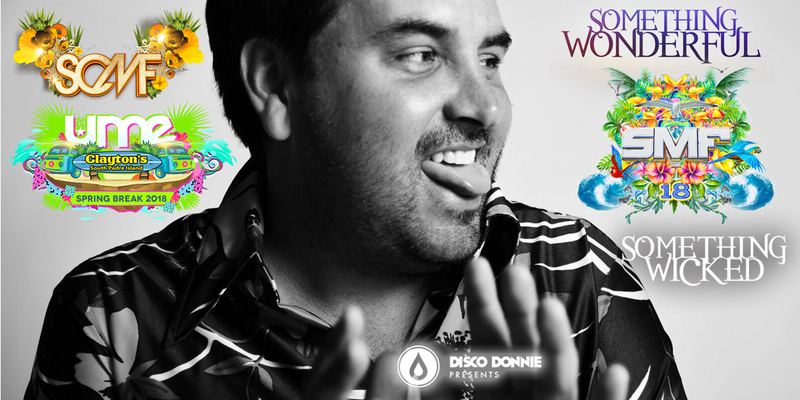 Disco Donnie Presents (DDP) is an award-winning and recognized leader in electronic dance music event production, founded by veteran promoter James “Disco” Donnie Estopinal. Since the company’s inception in 1994, DDP has sold over 10 million tickets producing 10,000 live events, arena shows, and outdoor festivals in over 100 markets around the world including the U.S., Mexico, Canada, and Latin America. Annually, DDP is responsible for organizing and promoting nearly 1,000 club events across the U.S. ranging from Portland, Philadelphia, Houston, Tampa, New Orleans, Dallas, and St. Louis to name only a few; plus major festivals such as Ultimate Music Experience, Sunset Music Festival, and Sun City Music Festival. Founder and CEO, James “Disco Donnie” Estopinal, Jr. is considered one of the godfathers of U.S. electronic dance music, evolving over the past 24 years to become one of the top dance music promoters globally. From his early days in the 1990s New Orleans dance scene, Disco Donnie coupled eccentricity with ingenuity to create elaborately themed parties that charmed patrons, garnered an international following, and unwittingly became a catalyst for a national debate over the First Amendment right to expression. From 2008-2012, Donnie partnered with Pasquale Rotella, CEO of Insomniac Events, setting their sights on strategically developing the Insomniac brand throughout the U.S. Working together the pair ushered Electric Daisy Carnival into core Disco markets like Orlando, Dallas, and even Donnie’s current home on the island of Puerto Rico. The partnership produced hundreds of club shows every year in markets across the U.S., helping make Insomniac a household name. In 2012, DDP shifted its focus to the genesis and development of SFX Entertainment, as the first company to sign with founder Robert F. X. Sillerman; a media entrepreneur with a vision to invest nearly a billion dollars in electronic dance music to bring the world’s leading promoters under one roof. Since 2017, Disco has become part of LiveStyle entertainment group with a worldwide portfolio including Disco Donnie Presents, React Presents, Life In Color, Made Events, ID&T, Tomorrowland, Sensation, TomorrowWorld, Beatport.com, Electric Zoo, Awakenings, Q-Dance, and more.